Polycarbonate electrical housing box. Laser marked on two sides. For lasting beauty and durability. 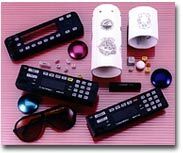 These are just a few of the millions of laser marked plastic radio buttons we have processed. These are examples of our laser engraved remotes.